Our flexible financing arrangements such as an operating lease are designed to help your customers secure the assets they need to succeed – without straining their budgets or adding unnecessary risk. Every business requires equipment, but not every business can justify the expense of an outright purchase. There are many reasons for this: they may have no budget left to allocate, the finance department may take issue with the transaction or they may have a functional asset that performs competently albeit not especially well. Operating lease presents a solution to this problem. If your customers are looking to secure vital assets from you without making a significant upfront financial commitment, an operating lease is a very attractive option. The way it works is simple. Over the course of an agreed contractual period, they pay a fixed periodic rental (+VAT). During this period, they’ll have full, unrestricted access to the asset. At the end of the contract, the asset is returned. Different kinds of operating lease convey different advantages to your customers. One of the main advantages is that the customer will have lower rentals as the finance provider assumes a resale value at the end of the contract. Another advantage is that ownership isn’t a consideration – and neither are its possible burdens. This is a bigger advantage than you might think. Managing a series of small, fixed outgoings across 12-60 months is typically easier for cash flow-sensitive businesses than paying upfront. What’s more, an operating lease can also come with added extras such as support with maintenance and implementation. 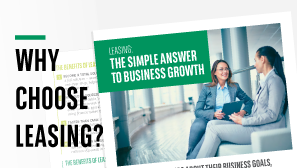 Giving them more options gives them more incentive to invest in their business– and more incentive to stick with your company when the lease expires. Why BNP Paribas Leasing solutions ? At BNP Paribas Leasing Solutions, we provide convenient, flexible solutions to our partners. Our operating leases aren’t just designed for one-off transactions: they’re geared towards making your business bigger, better, and more competitive. We pay all invoices quickly – and normally within 24 hours – giving you improved cash flow and less credit risk, offering you the opportunity to venture into larger sales. With BNP Paribas Leasing Solutions, you’re gaining access to a product that’s simple, approachable, and easy to manage – and a team that’s dedicated to providing you and your customers with the most suitable finance products. We can provide leasing solutions for a range of different industries such as construction machinery finance, materials handling finance, van leasing and agriculture finance.